Critical analysis of Keg de Souza’s community based artworks. 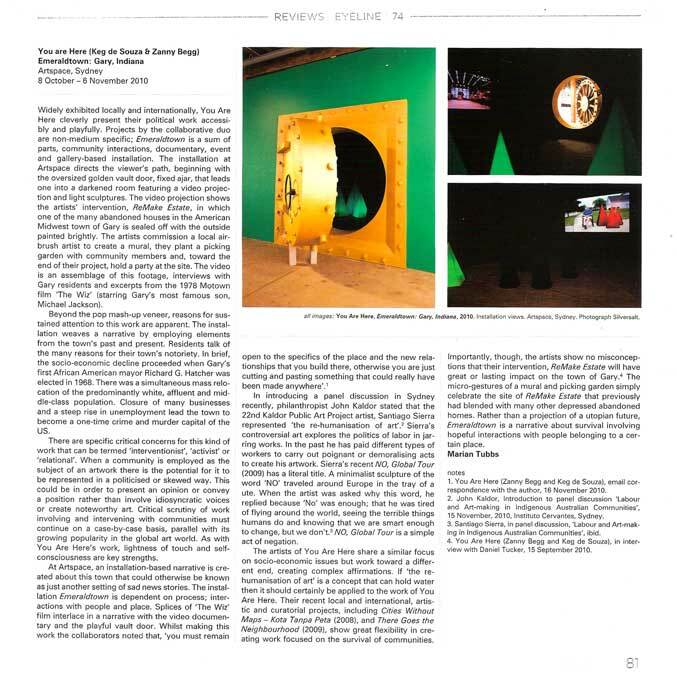 Throughout this paper I’m going to discuss Keg de Souza’s work and how it fits into the community-based art framework that Claire Bishop’s critiques in her essay “The Social Turn: Collaboration and its Discontents” from Artforum International in 2006. De Souza is an artist who breaks down the binaries of art. By disrupting the form and structure of ‘public art’ through her artwork de Souza allows for the focus to regenerate into conversations and events that she creates. Claire Bishop discusses how community art often comes with limitations and can become problematic for a number of reasons. These reasons manifest into issues surrounding ownership, aesthetics, value, and how the quality of art can be effected by morals. The dilemma, that surrounds community art and its morals, doesn’t exempt de Souza. From an outsider perspective, questions arise around her intentions for creating these artworks. For example, is her work created with the community in mind? Or does she abuse her power as an artist to create these works? However, whilst de Souza may be successful in creating a diplomatic space that breaks down hierarchies through an art premise, Bishop is critical of the idea that we can all share this democratic space. De Souza asks her audience to acknowledge their privilege, yet how would the artwork exist without it? De Souza’s work lends itself to a utopian model of communal interaction where equal participation of all harmonious togetherness is a collective action. Yet, de Souza acknowledges the limitations of working collaboratively in an interview with NAVA and says collaboration can be difficult when “both, or all parties are stuck on a particular issue, it’s important not to collaborate just for collaboration sake... it’s important to understand the other party’s ideas and understand how they work.” This adds a useful model for understanding the premise of relational aesthetics when the goal of the artwork isn’t forced into what the artist wanted. By letting go of authority and control, the artwork can take a much different direction. De Souza accepts that collaboration can’t create ‘micro-topias’ or ‘micro-communities’ just by trying to, thus, realises Bishop’s premise that healthy democratic communities are not reached on an unrealisable ideal of harmonious togetherness. Rather, those that allow space for dissent or disagreement. Yet again, whilst de Souza’s work may allow for disagreement we don’t actually see this in her artworks. This highlights a limitation of socially engaged art, where the works are judged on their moral ground and how much does the artist give authority over. Thus, aesthetics value, features, or impact of works can be ignored. The duality of this work and the pulling of “you” into the “here” manifests into the gallery space in the latter part of this artwork Emeraldtown: Gary, Indiana. The project transforms the results from their community-based artwork and reinvents its self into an exhibition for Artspace, Sydney. The exhibition was made up of sculptural elements consisting of a large gold, safe-style door which served as the entrance to a private screening room of a three-part documentary. The documentary was made up of three parts: “Turning Green, with its focus on Gary and its African American population; Into the Red, which elaborated upon the context of the US steel industry and discussed the impact of the company moving to regions with non-union employment options; and Gold Standards, which elaborated upon some of the industries that remain in Gary.” These documentaries, rather than just offering information about Gary and its issues “functioned as an entertaining and thoughtful introduction to the work, identifying some of the political issues they sought to negotiate within the series of interviews.” De Souza and her collaborators, thus created an artwork that does apply the capitalist notions of creating a product over process. Within Emeraldtown: Gary, Indiana the rationality comes from a means over ends artwork, yet the message sits in the lines of a gallery space and results in an exhibition that isn’t site-specific. However, as Maria Lind wants us to remember “when politics in principle are completely steered by economics and the economy follows a capitalist logic, then culture tends to become an arena for ideological debate.” By drawing the integrated motif of the 1978’s The Wiz which presents the familiar tale of The Wonderful Wizard of Oz in the context of African American culture, de Souza borrows a culture that isn’t hers and thus creates a problematic result. This artwork recycles the relational aesthetic framework but allows space for dissent or disagreement. The hierarchy is built up again with the spectator as the viewer for the artwork and becomes an exhibition where the process is simply a ‘walk-through’ affair. Keg de Souza is an artist who draws on the social engagement as a medium for her art. As shown in this paper the framework for relational aesthetic art has been manipulated into artworks that engage the social and the participatory elements. Yet, rather finish these works in a gallery; their ambition for the artwork is left at the site it was created. The examples displayed throughout, show how community-based art can both exist independently in its community and then be displayed in an art context and importantly how the meaning changes depended on who sees the art and where they saw it. Claire Bishop’s “The Social Turn: Collaboration and its Discontents” provided a template on how often the artwork is expected to serve both the community and the art gallery. However, the means-ends rationality of contemporary art can’t provide this duality as once in an art gallery, the artwork lends its self into the capitalistic predilection that space commands. 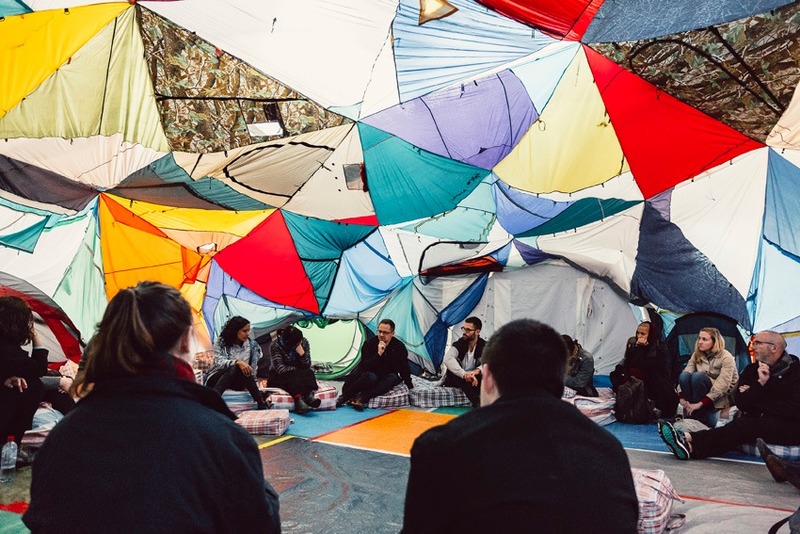 This works both ways as socially engaged art practices in the community are often judged by the task of strengthening the social bond, rather than its success, resolve, and interest gathered. As displayed Bishop is highly critical of this, and the multi-layered experience that de Souza creates allows for a successful critic in this framework. Her breakdown of hierarchies provides a fun and informative experience for the audience with multiple elements to intrigue the spectator into a participatory stance. Ball, Sydney. “Keg de Souza gives us food for thought.” Beatroute. September 2016. Masters, H G. “20th Biennale Of Sydney.” Art and AsiaPacific. Issue 98. May/Jun 2016. pp.116-117. Munting, Brianna. “Keg De Souza: Vodcast” NAVA. June 2014. Tubbs, Marian. “You are Here (Keg de Souza & Zanny Begg) Emeraldtown. Gary, Indiana.” Eyeline. 2010. Visual Arts Features. “Fellow Focus: Keg De Souza.” Australia Council for the Arts. January 2014. Claire Bishop, “The Social Turn: Collaboration and its Discontents.” Artforum International, 2006. Vol.44(6), page 2. Bishop, “The Social Turn: Collaboration and its Discontents,” page 7. Bishop, “The Social Turn: Collaboration and its Discontents,” page 3. Brianna Munting, “Keg De Souza: Vodcast,” NAVA, June 2014.